Requirements: Mac OS X 10.4.3. Universal. I like small efficient programs that do one task well. That’s a hangover from my Unix days, and you can blame Kernighan and Ritchie for that attitude. I also own a brand new MacBook Pro (Core 2 Duo). I’m changing jobs in January and will have to leave my almost-new MacBook Pro (Core Duo) behind because it’s a university-owned computer. So I now own my notebook and am not using an issued unit. But that’s a story for another time. One thing a notebook owner needs to do is keep tabs on her computer’s battery. In fact, even with current battery technology, it’s a good idea to condition the battery at least once each month. Conditioning refers to a complete depletion of the battery’s energy reserves and then a full recharging. In addition, a tool that monitors the battery’s condition is a good idea as well. Enter coconutBattery. There isn’t much in the preferences list to set, just a custom battery capacity and a computer serial number (should the software not determine these facts automatically). The former is used to track battery condition and the latter to determine the approximate age of the computer. For my system, I left these alone because the program sensed the appropriate values correctly. The main program window presents data sensed from the system, including current battery-charge state, maximum energy, number of load cycles, age of the system, and more. 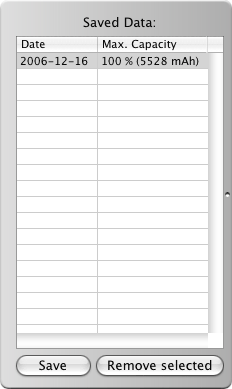 A screen capture of the main window is shown below. coconutBattery offers the facility to store the maximum capacity of the system battery so the user can track battery condition over a period of time. That information is stored in a side panel accessed by clicking the small triangle to the right of the Additional Info heading. It’s a fact that computer batteries age. When they age, they lose energy capacity. Even with conditioning, there are a finite number of charge/discharge cycles a battery can sustain. Knowledge of the number of cycles and the current maximum energy storage capacity of the battery informs the user when it might be appropriate to replace the battery. One caveat is appropriate. 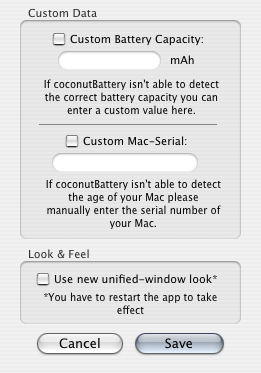 When I run coconutBattery, my system seems to be under a relatively heavy workload. After a few minutes, the system fans really began to crank. 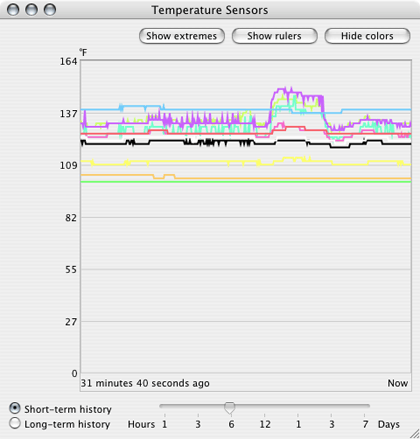 I loaded up the excellent Temperature Monitor utility and made the screen capture displayed below. The pink curve depicts the CPU temperature. The rise begins when I start coconutBattery and declines after I shut down the program. I’ve e-mailed the programmer about this situation but have not had a response as of this writing. It isn’t that the load is untenable; I’m just curious why the program induces such a heavy thermal load. I also loaded Activity Monitor and watched the impact on system performance as the program ran. It was second or third on the list, which doesn’t seem all that bad. I want to monitor the status of my system’s battery. I picked up a copy of coconutBattery for that purpose. So I’ll be checking the battery periodically with this program. It’s actually a pretty good little utility that fits my sense of how things should be done. 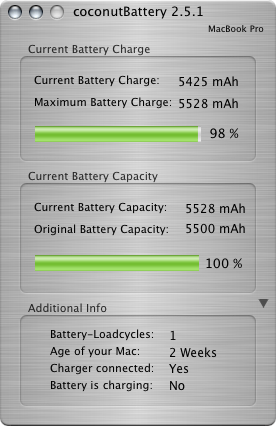 I’m giving coconutBattery a Good rating because of the CPU load that appears while the program is running. coconutBattery is a simple, elegant program for monitoring a very important system resource. Copyright © 2007 David B. Thompson, dthompson@atpm.com. Reviewing in ATPM is open to anyone. If you’re interested, write to us at reviews@atpm.com. I've also had the issue of increased temperature and fans revving up once coconut battery is launched, even without anything else runnin except the finder. It's interesting that you noticed this too. I don't have access to any of the PowerPC machines anymore, so I can't confirm they respond similarly. It would be interested if someone would test that. I have noticed that on my 12" 1.0, CPU usage appears to cycle dramatically every few seconds from almost minimum to maximum. Strangely activity monitor only reports Coconut using between 1 and 2 % CPU. When I quit Coconut battery things return to normal. No fan or excessive heat on my 15" 1.67GHz AI PB. 1GB RAM. Coconut is using between 1 - 2% from Activity Monitor. While this model portable has always run warm to hot the fan has almost never come on. Actually, can't ever remember it kicking in, even doing serious crunching. Currently running a whack of applications. Everything from LaunchBar to EarthDesk to Acrobat Pro to Photoshop to... The processor runs around 128F regardless whether Coconut was running or not.